Sir Arthur John Gielgud OM CH (14 April 1904 - 21 May 2000) was a British actor and director. Gielgud was born in South Kensington, London and attended Westminster School. He acted in theatre, on radio, television and in movies. Gielgud won many awards, including an Academy Award, two Emmy Awards, three Tony Awards, a Grammy Award and two Golden Globe Awards. In 1992 he received a BAFTA Academy Fellowship Award, a lifetime achievement award. The Globe Theatre in London was renamed the Gielgud Theatre in 1994 in his honour. Gielgud was gay. He was in a long-term relationship until his partner died in 1998. 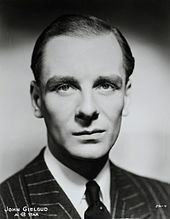 Gielgud died in Wootton Underwood, Buckinghamshire. ↑ Nicole Lyn Pesce; Joe Dziemianowicz and Margaret Eby (3 March 2014). "Oscars 2014: Bobby Lopez becomes youngest person to get an EGOT with Best Original Song win for 'Let It Go'". New York Daily News. Retrieved 6 March 2014. This page was last changed on 28 January 2019, at 01:57.